Hello there! My name is Mina and I’m a 6 week old little girl! My siblings and I feel so lucky to be welcomed into the GPRA family. You see, we are PYR/lab mix puppies. Our dad is a Great Pyrenees, and our mom is Labrador Retriever. We may not be full-blooded Great Pyrenees, but everyone keeps telling us that we are absolutely great…and adorable! Let’s just say that we will be the best of both breeds! The family who had us wanted to make sure that we found the very best homes so they asked GPRA to help. Now, being a puppy, I’m not really sure what a “good home” is, but everyone here keeps telling us that we will have nice warm beds, lots of food and treats, and wonderful people to love and play with us. I don’t know about you, but I think that sounds just PYRfect! For now, my siblings and I are happily settling into our foster home and starting to learn all those things that puppies are supposed to learn. There are other animals and kids here so we have so many things to learn from all of them. Our foster mom says that when we are ready to go to our forever homes in a few weeks, we will have had the best start possible and on our way to being the best family members ever! 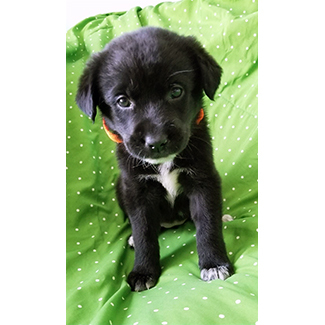 If you think me or one of my siblings would fit right into your home, please email us at info@greatpyratlanta.com or click the “Apply to Adopt” button below.